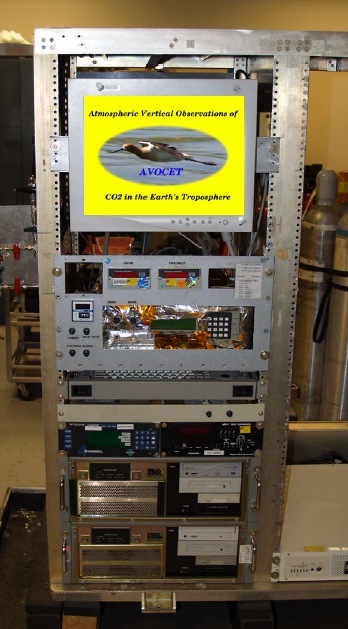 The NASA Langley CO2 sampling system (AVOCET) has an extensive measurement heritage in tropospheric field campaigns, delivering high reliability over 3400 flight hours (452 science flights) and is recognized within the CO2 community as a benchmark for evaluating newly evolving remote CO2. Carbon dioxide measurements will be provided by a modified LI-COR model 6252 non-dispersive infrared spectrometer (NDIR). This instrument was adapted by the investigators for airborne sampling and has been successfully deployed aboard NASA research aircraft beginning with the PEM-West A mission in 1992, and more recently during the 2008 ARCTAS, 2009 ICE Bridge, and 2010 ASCENDS missions. The basic instrument is small (13 x 24 x 34 cm) and composed of dual 11.9 cm3 sample/reference cells, a feedback stabilized infrared source, 500 Hz chopper, thermoelectrically-cooled solid state PbSe detector, and a narrow band (150 nm) interference filter centered on the 4.26 μm CO2 absorption band. Using synchronous signal detection techniques, it operates by sensing the difference in light absorption between the continuously flowing sample and reference gases occupying each side of the dual absorption cell. Thus, by selecting a reference gas of approximately the same concentration as background air (~390 ppm), minute fluctuations in atmospheric concentration can be quantified with high precision. Precisions of ≤ 0.1 ppm (±1σ) for 1 Hz sampling rates are typical for our present airborne CO2 system when operated at 250 torr sample pressure. Vay, S. A., et al. (2011), Patterns of CO2 and radiocarbon across high northern latitudes during IPY 2008, J. Geophys. Res., 116, doi:10.1029/2011JD015643.